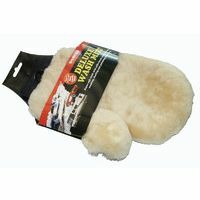 The Deluxe Wash Mitt is made from genuine lambs wool. The shaped thumb and elastic band base make for a comfortable, easy, snug fit. It's great for washing and polishing and can be used wet or dry.